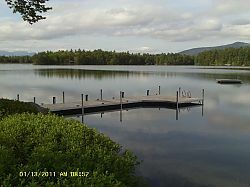 A seasonal dock is defined as a structure that is installed into the water in the spring and removed in the fall. 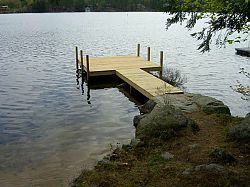 Typically a seasonal dock is made in wooden sections supported by galvanized pipe or 4 x 4 posting. 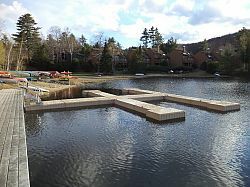 These docks are cross-braced between the standing supports to stabilize the dock from moving side to side and to keep the dock stable under adverse conditions. Seasonal docks today are made with either wood or aluminum frames. The aluminum docks offer many advantages over the traditional wooden dock in such ways as removable decking that can be stored off-season, lightweight dock frames for easy installation and removal and years of enjoyable usage without the worries of repair or replacement when you need the dock most. We offer a full line of ShoreMaster aluminum docks and accessories that have proven resilient year after year whether it’s a free standing or floating dock. And if you prefer the traditional wooden docks we custom make all of our dock sections to fit your specific needs. Since there are many different dock options, give us a call today and let us help you determine the correct dock for your usage and water front needs. We offer full installation and removal services over the course of the spring and summer months which includes installs, removals, repairs and replacement of docks. 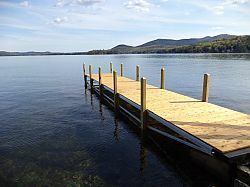 We recommend that the dock be inspected prior to installation to determine seasonal installation and removal and or maintenance costs so you have a safe and enjoyable time, without worry. We offer competitive pricing in installation and removal of all types of seasonal docks. Gives us a call for a professional quote on our dock services.